﻿﻿﻿﻿As the sun comes up across a Texas coastal flat, the silhouettes of coastal birds begin to slowly weave through the sky. The dedicated, early-rising wade-fisher walks along the surf, trying his luck. He’s seen a dolphin and caught a redfish already. It’s going to be a good morning — he can feel good luck quivering in the tip of his rod. Wade-fishing the shallow flats of our Texas coast offers some noteworthy advantages over other forms of fishing, even more than the quiet beauty of a coastal sunrise. Economically speaking, wade-fishing requires much less financial investment because there’s no boat, so no need for insurance, trailer or fuel. You have to carry your gear, so it’s simple by necessity. 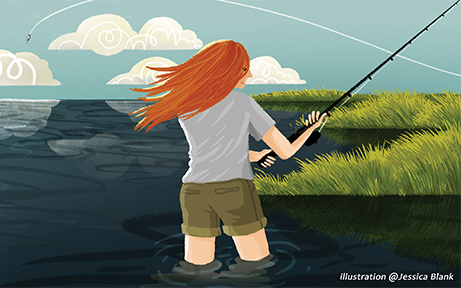 Keeping your feet in the water offers a more connected fishing experience. Walking through the flats brings you up-close to all kinds of natural wonders you’d miss speeding by in a boat. Find your own private area away from the crowds and really let the magic of the coast wash over you. Red drum, spotted seatrout, black drum, flounder and ladyfish are some of the most popular species, but the coastal bounty is widely varied. There’s no shortage of land available for this sport, with hundreds of miles of accessible coastline and acres and acres of shallow coastal flats to walk. Waders and/or wade shoes. When water temperatures are low, you’ll need good waders. Some anglers still wear waders in the summer, just for protection. High-quality wading boots will help you keep your feet out there. Sun protection. Don't forget hat, sunglasses and a long-sleeve shirt. Medium-weight casting rod. A sturdy, medium-weight spinning rod (use a 12- to 15-pound line) is generally a good rod for wade-fishing the Texas coast. Vest. Anglers wear many-pocketed vests to keep all their gear well organized. Map. Many tackle stores sell maps of specific wading areas. Rod/wading belt. A wading rod belt can help you secure your rod when handling a fish or tying on a new rig, or can help with a second rod. Lures. Any tackle store will be glad to recommend some lures to use in the area. Some prefer shrimp and mullet soft plastics and MirrOlure-style casting plugs. Floating bait bucket. If you aren’t using artificial lures, these buckets will keep your bait alive. Many wade fishers also catch their own bait with cast nets, making wade-fishing even more economical. Landing net and wading stringer. Carry a net to land the fish, and if you intend to keep your catch, bring along a long wading stringer. Go with friends. Don’t go alone. Let others know where you’ll be, too. Take it slow. Wading’s a pretty good workout, so don’t expect to wade for miles and miles.